Virmond M, Joshua J, Solomon S, Duerksen F. 30 September 2017, posting date. Surgical aspects in leprosy. In Scollard DM, Gillis TP (ed), International textbook of leprosy. www.internationaltextbookofleprosy.org. Physical deformities and disabilities impact the well being and quality of life of leprosy-affected persons. Besides the symptoms of leprosy and reactions that may occur unpredictably during and after treatment, established deformities and disabilities lead to physical limitations in function that can have a marked negative effect on a person’s social participation. Social exclusion may be the result. Despite the advances in many areas of this old disease, mainly in immunology (see Chapter 6.1) and genetics (see Chapter 8.1), the early detection of cases and adequate treatment with WHO-recommended multi-drug therapy (MDT) is still the primary strategy to reduce the incidence of the disease in countries where it is still prevalent. Taking into consideration the high social, economic, and emotional burdens of the disabilities caused by leprosy, surgery offers important tools to improve the physical and cosmetic condition of persons affected. Unfortunately, regardless of the robustness of MDT, many individuals will be cured of the infection but left with some level of residual impairment of physical abilities, restricting normal labor and social life. Surgery may be the answer for correcting or ameliorating these restrictive conditions, not only allowing rehabilitating individuals to regain their role in society, but also fighting stigma. In addition, surgery has a substantial impact on leprosy control programs, or elimination strategies, because it clearly demonstrates that deformity is no longer an immutable hallmark of the disease and, therefore, a mark of stigma (see Chapter 4.5). What follows is an abridged, although complete, view of surgery with respect to leprosy, both its possibilities and limitations. To the plastic or orthopedic surgeon, this chapter shows that the techniques used in leprosy cases are not markedly different from those used for similar conditions resulting from trauma. For example, a Zancolli’s lasso procedure for a clawed hand due to trauma to the ulnar nerve has no essential technical differences from the same technique for a clawed hand due to irreversible ulnar nerve entrapment at the elbow caused by leprosy. The same applies for treatment of drop-foot or clawed-toe. This similarity means that leprosy patients can be treated by standard orthopedic hand and plastic surgeons in any hospital facility. It also means that the stigma of leprosy is a senseless attitude that must be fought. To the leprologist, this chapter shows that surgery is a complementary aid for a clinician aiming to offer the most comprehensive treatment to a patient. Sometimes, drug treatment for neuritis is not enough and, in select cases, a surgical release may reduce the need for high doses of steroids, can improve sensation, and will reduce pain. Hopefully, this discussion will convince clinicians that referral to a surgeon may be a choice to be considered in some situations. Lastly, to managers of leprosy control programs, this chapter underscores that a referral to surgical services will increase the credibility of the program and, in addition, will give the program an innovative and ethical appeal. The most stigmatizing deformities in leprosy are seen in the face. In lepromatous leprosy, M. leprae infiltrates the skin (see Chapter 2.4), subcutaneous tissue, and mucosae of the nose, mouth, and larynx. The eyebrows fall out due to the resultant madarosis, the universal stigmatizing sign for leprosy. The ears and earlobes are enlarged. (See Chapter 2.1 for clinical findings.) The first change seen in the nose is that the nasolabial angle becomes acute as a result of the resorption of the spine of the maxilla. The mucosa of the nose (see Chapter 2.4) may be heavily infiltrated and ulcerated, and may become secondarily infected, cutting off the blood supply from the septum of the nose, which may perforate. The nose gradually collapses until it is totally telescoped; the nostrils are turned upwards and the alae are flat and folded (Figure 1). With the ulceration and infection of the mucosa inside the nose, the cartilage of the septum disintegrates and the dorsum of the nose collapses progressively until the whole nose is pulled in with the nostrils looking upward. The skin, however, is not involved. The peripheral nervous system (see Chapter 2.5) also affects the face via lesions of the facial nerve or its branches. The involvement of the zygomatic branch is the most common, resulting in lagophthalmos. The involvement of the ophthalmic nerve, a branch of the trigeminal nerve, causes anesthesia of the cornea. The combination of corneal anesthesia and lagophthalmos is very dangerous for leprosy patients because it can lead to blindness. The facial nerve divides into upper and lower main branches. The upper branch divides into the zygomatic and frontal nerves. The zygomatic nerve is the most important nerve because its involvement may cause paralysis of the orbicular muscles of the eye (lagophthalmos), the function of which is to close the eyelids and wash, lubricate, nourish, and protect the cornea. With sensory loss of the cornea, there is a real danger of developing exposure keratitis and ulcers. This situation is very dangerous in leprosy, because the patient does not feel the need to blink. Blindness is a possible outcome. There are static and dynamic procedures for treating lagophthalmos , , , , ,  (see Figure 2). The tarsal strip procedure is indicated when there is anesthesia of the cornea. The goal of this technique is to shorten the tarsus in the eyelids and approximate the eyelid’s margins, covering most of the cornea. A dynamic treatment of lagophthalmos is the Temporalis Muscle Transfer (TMT) procedure as described by Gillies . Andersen  was the first to describe the technique and its results. The procedure consists of separating a 1.5 cm band of temporalis fascia from the zygoma and the muscle, continuing 1 cm into the cranial periosteum. The middle third of the temporalis muscle is now dissected sub-periostically downwards to the zygomatic area in a conical form and transferred through a subcutaneous tunnel to the lateral corner of the eye. The fascia is divided into two strips and tunneled close to the edge of the eyelids to the medial area of the eye. The medial canthal ligament is dissected and both tendons sutured to this ligament under appropriate tension (see Figure 3). Johnson’s method of performing a TMT is easier, with results equal to, if not better than, those obtained using Gillies’ method. A portion of the temporalis muscle is detached from its insertion into the mandible, through a small anterio-superior incision above the pinna of the ear. A strip of fascia taken from elsewhere is attached to the stump of temporalis muscle, divided into two strips and tunneled, one at the edge of each eyelid, to the medial canthal ligament and sutured there. TMT is not an effective treatment for patients with a combination of lagophthalmos and corneal anesthesia, possibly because there is no sensory input to the patient that suggests a foreign body (e.g., dust) is on the cornea. Hence, patients do not feel the need to use the transferred muscle. Patients with intact corneal sensation can at least be trained to use the transferred muscle as soon as the afferent impulse of dust on the cornea reaches the reflex center. The tarsal strip procedure is an alternative procedure in this case. However, with good sensation in the cornea, TMT achieves successful long-term results. Ranney and Furness  reviewed 54 TMTs, with good results in 26, fair in 8, and poor in 20. The poor results were related to low tension of the tendons. The complete collapse of the nose is probably the most stigmatizing deformity resulting from leprosy. The nasal mucosa thickens and ulcerates due to the infiltration of granulomas and M. leprae . The earliest sign of leprosy in the nose is an acute nasolabial angle. The spine of the maxilla is reabsorbed, the base of the columella is withdrawn into the nose, and the nose is bent forward giving it an ape-like look . The treatment of this deformity is to relocate the base of the columella anteriorly, and provide a base for the columella with a pyramidal graft of cartilage sutured to the maxilla. For a mild dorsal collapse, an inlay cartilage or bone graft is usually enough to correct the deformity . The PNEI is performed through an incision in the alveolar-labial sulcus in the mouth. After all of the scars are freed, the raw area must now be lined with a skin graft. A mold is made out of dental guttapercha to create a normal nasal formant. The mold is covered with a splint-thickness skin graft, with the deep surface outwards, and inserted through the upper lip opening. A bone or cartilage graft can be used to give the nose structure. A cantilever type of graft inserted into the frontal bone, or a dorsal graft with a strut in the columella that maintains the elevation of the nose, can be used. Usually the bone grafts (if used) are done as a second-stage procedure. The nasolabial flaps of Farina  is a method frequently used in South America. To expose the scarred area in the mucosa, the front of the nose is freed by incisions through the base of the alae and the columella, lifting the nose like the hood of a car. The scarred area is resected and the nose freed from all adhesions. On each side a nasolabial flap of about 1 cm width is elevated, and the flaps are rotated into the raw area and sutured in place. Some surgeons introduce the cartilage or bone graft at the time of the flap insertions, an approach not recommended because an infection often results. New methods to reconstruct the nose have been published. Menger, Fokkens, Lohuis, Ingels, and Trenite  and Shah, Zeitler, and Wise  report on techniques using costal and ear cartilage grafts, or a combination, to give structure to the nose. The most common complication is the partial reabsorption of the graft. Generalized infiltration of M. leprae occurs in the face, but is most severe in the earlobes, probably because the temperature is lower in that area. The lobule of the ear can elongate several centimeters because of an M. leprae infection. When a patient presents with a permanent deformity, the authors use the Guerrero-Santos  technique. This technique involves the shortening of the earlobe by excising a full-thickness triangle. For cosmetic reasons, it is important to leave about 5 mm of lobule at the junction with the face. Many surgical techniques have been described for correction of the mega lobule , . The eyebrows play a significant role in demonstrating emotion. In lepromatous leprosy, the hair follicle is directly damaged by the invasion of M. Leprae , causing the loss of eyebrows. The absence of eyebrows is an almost universal stigmatizing sign of leprosy. There are three ways to correct madarosis: the free scalp graft, the island pedicle scalp flap, and hair follicle implants. The free scalp graft is the simplest correction. A pattern for the eyebrow is cut out from a suture packing. The size and location is best determined by observing the eyebrows of a co-worker in the operating room. The full-thickness graft including the fat layer (to ensure that the bulbs of the hair follicles are harvested cleanly) is taken from the scalp where the hair is growing obliquely or flat. Augmentation loupes and very fine pointed scissors are necessary to carefully de-fat the graft without damaging the bulbs of the hair follicles. The graft is sutured in the eyebrow area, and a tie-over dressing and a mild compression bandage are applied. The patient must be told that the hair from the graft will fall out but will re-grow in three to four months. The temporal artery, and the occipital or the frontal branches, are long enough to reach the eyebrow area. The artery selected is followed by palpation or Doppler and marked. An area of scalp with hair in the appropriate direction, i.e., it crosses or is in line with the artery, is marked with the eyebrow pattern and incised. The pedicle is dissected and the graft and pedicle are tunneled to the eyebrow area. The graft is sutured in the prepared bed  (see Figure 4). In this technique, single hair follicles or a group of follicles are implanted in the eyebrow area through a small incision or with a needle. After the lepromatous infiltrates in the skin of the face subside, there is redundant skin left that wrinkles or folds. The patient may look much older than he or she is. Standard procedures in plastic surgery can be used to correct this issue. 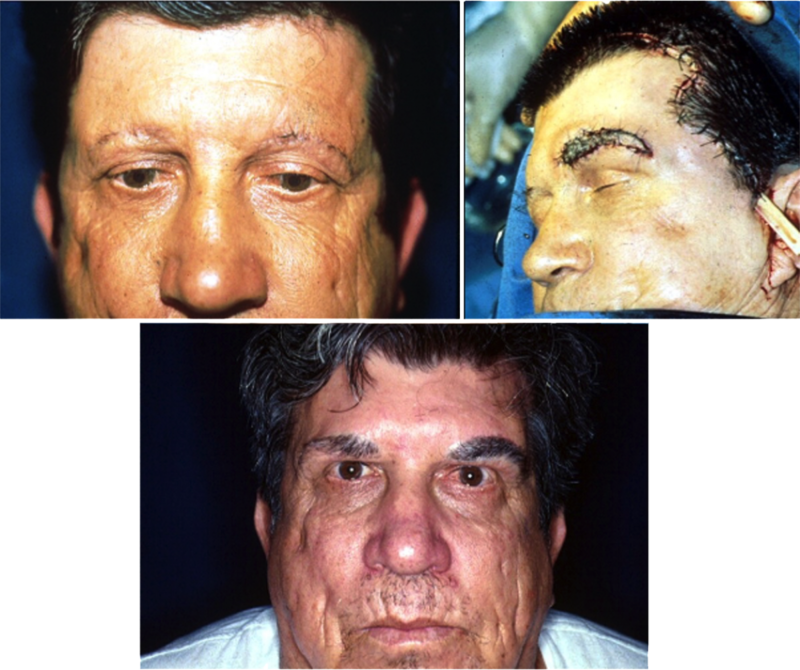 The results in leprosy are not as good because there is a loss of the elastic fibers in the subcutaneous tissue, which is why some surgeons suggest a perioral (anterior) face lift with full thickness excision of the edge of the incision line at the nasolabial folds. A blepharoplasty is often indicated because the excessive skin can fall over the eyelid and damage the cornea. In patients with wrinkling and folded skin more prominent over the cheek areas, an incision from base-of-ear to base-of-ear along the front of the neck may be used to undermine the loose skin of the side of the face. In a process similar to the anterior face lift, an appropriate quantity of skin at the incision line is excised. When the wound edges are now approximated, the facial skin is stretched and smoothed out. There are no publications that address quality of life related to surgery of the face in leprosy, and very few related to cosmetic surgery of non-leprosy patients. In 2014, one group of researchers developed a questionnaire, the FACE-Q, to measure patient-reported outcomes of quality-of-life issues as a result of aesthetic cosmetic surgery. The result had excellent reliability and validity, making it a good outcome tool for facial cosmetic surgery . Klassen, Cano, Schwitzer, Scott, and Pusic  developed five new FACE-Q scales and a single symptom checklist: Psychological Well-being, Social Function, Satisfaction with Decision to have Treatment, Satisfaction with Outcome of Treatment, and Early Life Impact of Treatment. Tendon transfers are essentially muscle balance procedures. For these procedures to be successful, the challenge that should be addressed is one of muscle imbalance. Associated problems such as joint contractures, subluxations, and muscle and skin contractures (long flexor contractures in the hand and foot, Achilles tendon contractures of the leg, and skin contractures of the fingers) need to be dealt with separately prior to a tendon transfer procedure. The outcome of the surgery depends on the preoperative passive range of motion of the joints across which the transferred muscle-tendon complex acts. 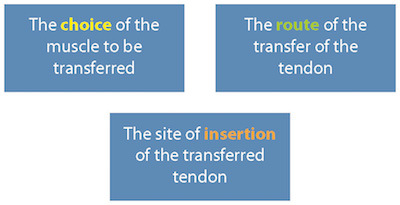 The three variables in tendon transfer surgeries that determine the resultant function are shown in Figure 5. In setting up a tendon transfer, one should employ careful handling of the tendon to prevent damage to its surface and gentle dissection of tissues to avoid excessive scars. The incision should be planed to transversely cross the direction of the transfers and minimize adhesion formation. 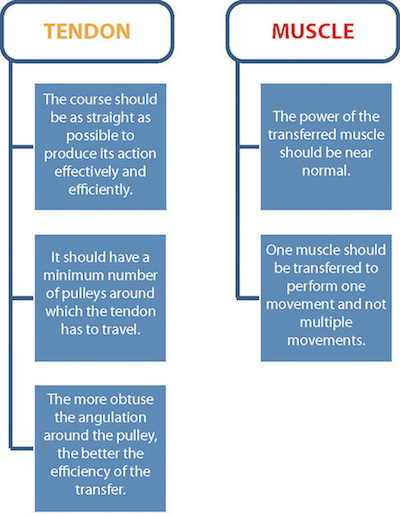 Figure 6 lists the general principles for tendon transfers. Ulnar nerve damage proximal to the elbow  could cause loss of function of the lumbrical muscles and the interosseous muscles. This damage results in instability of the hand, in which flexion of the metacarpophalangeal joints and extension of the interphalangeal joints (‘clawing’) are lost. This muscle imbalance can be countered by transferring an acting extrinsic muscle of the hand to do the function of the paralyzed intrinsic muscles. The muscle transferred is usually the palmaris longus, the extensor carpi radialis longus, or the flexor digitorum superficialis of the middle or ring finger (see Figure 7). After tendon transfer surgery, a short three-week period of immobilization in a cast or splint is required before mobilization by a trained therapist over a four-week period. Recently, early mobilization has been gaining acceptance by some surgical teams after controlled trials . In ulnar-median paralysis, the intrinsic muscles supplied by the median nerve are paralyzed in addition to the above ulnar paralysis, resulting in the over action of the extrinsic muscles of the hand. The pattern is of ulnar nerve damage proximal to the elbow and a median nerve lesion just proximal to the wrist in leprosy . Here the abductors of the thumb, in addition to the adductors of the thumb, are paralyzed. Therefore, in addition to the claw deformity, there is an inability to abduct and oppose the thumb. This loss is countered by a transfer of one of the extrinsic muscles, either an extensor or a flexor, to abduct the thumb and cause opposition. The muscles usually used are flexor digitorum superficialis of the ring finger or the extensor indicis proprius, the extensor carpi ulnaris, or the palmaris longus , . Post-operatively, a three-week period of immobilization followed by a month of physiotherapy and occupational therapy has been the standard conventional management. However, careful early mobilization is a possibility . 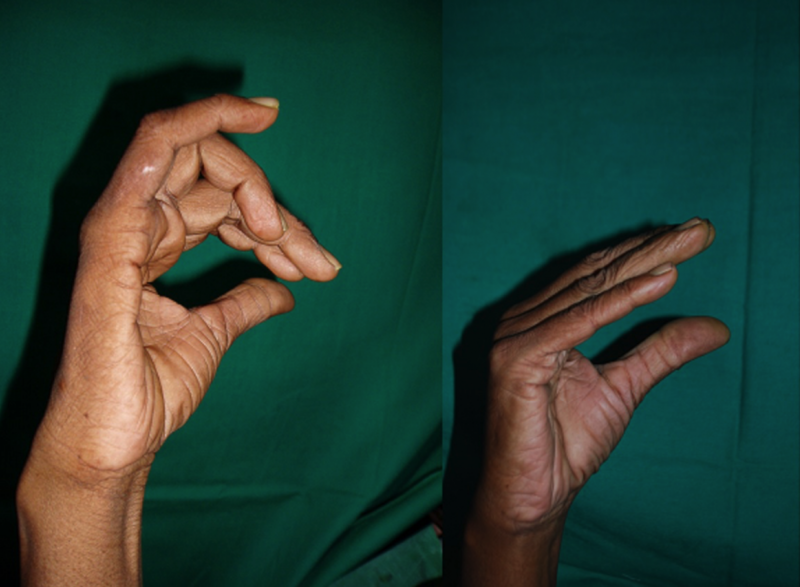 In leprosy, triple-nerve palsy (ulnar, median, and radial), rather than an isolated radial nerve palsy, is commonly seen. With triple-nerve palsy, the hand is almost totally useless. In this condition, the pronator teres is used as the active muscle and transferred to the extensor carpi radialis brevis to provide wrist extension. The flexor carpi radialis is transferred to provide four-finger extension, and the palmaris longus is rerouted to provide thumb extension. The flexor digitorum superficialis of the middle finger is transferred to provide metacarpophalangeal flexion of the four fingers, and the flexor digitorum superficialis of the ring finger is transferred for opponens plasty. Overall, the results are poor, possibly because of the multiple tendon transfers in the same hand, resulting in complicated re-education. In the feet, tendon transfer procedures are commonly used to correct foot drop, or paralysis of the common peroneal nerve (lateral popliteal nerve), and claw deformity of the toes, or posterior tibial nerve paralysis. Foot drop. Common peroneal nerve paralysis results in foot drop. The resulting muscle imbalance of foot drop causes a change in gait, with a loss of heel strike and damage to the forefoot. The functions of dorsiflexion and eversion are lost but can be restored using one muscle: the tibialis posterior. This muscle is rerouted to the dorsum of the foot either subcutaneously around the tibia (circumtibial route) or through the interosseous membrane (interosseous route) and is attached to the paralyzed dorsiflexors of the ankle. This correction restores a heel strike during a walking gait , . Immobilization following surgery ranges from four to six weeks, followed by four weeks of physiotherapy and gait training. Claw deformity of the toes. The tibial nerve may be damaged behind the medial malleolus, resulting in a loss of sensation in the sole and paralysis of the intrinsic muscles of the foot. The damage culminates in a clawing deformity of the toes, bringing the tips of the toes into contact with the ground and increasing the prominence of the heads of the metatarsals. 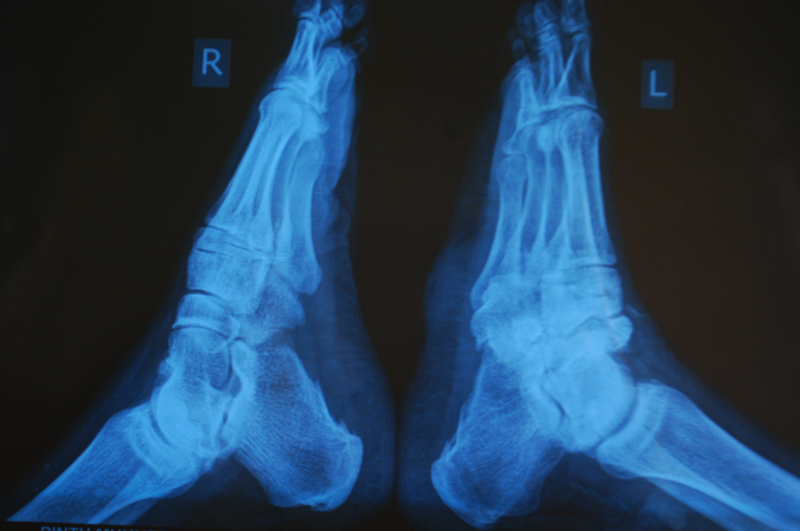 The metatarsal heads and toe tips are subjected to increased shearing forces while walking, often resulting in damage to the toe tips and metatarsal heads. For each toe, detaching the flexor digitorum longus from its insertion, transferring it to the dorsum, and inserting the tendon into the extensor digitorum (flexor to extensor transfer) straightens out the toes. This technique provides a more even distribution of weight and saves the toes and metatarsals from dangerous loads . Ulnar paralysis. Ulnar paralysis is corrected by tenodesis of the metacarpophalangeal (MCP) joints. Zancolli suggested attaching fascial slips to holes drilled through the necks of the individual metacarpals and suturing the other ends to the dorsal expansions. Srinivasan and Palande modified this procedure to the ‘extensor diversion graft’. In an extensor diversion graft, fascial slips or tendon slips are sutured to the extensor tendons over the metacarpals and passed volar to the l MCP joints. Then the other ends of the slips are sutured to the dorsal expansion on the proximal phalanges. This approach prevents hyperextension of the MCP joints . Once the MCP hyperextension is addressed, the long extensors of the fingers can function normally and the “claw” deformity is corrected. Boutonniere (hooding) deformity. Boutonniere (hooding) deformity of the fingers is corrected by dorsal fixation of the lateral bands. In Boutonniere deformity, the lateral bands and lateral slips of the dorsal expansion have slipped volar to the axis of the proximal interphalangeal joint. This slippage results in flexion at the proximal interphalangeal (PIP) joint and extension at the distal interphalangeal (DIP) joint. In dorsal fixation of the lateral bands, the lateral bands and lateral slips are released by cutting the oblique and transverse retinacular ligaments and suturing the lateral slips to each other on the dorsal aspect of the middle phalanx. This approach prevents the lateral bands from slipping volar to the axis of the PIP joint and restores function to the fingers , . Swan-neck deformity. The ‘swan-neck’ deformity can be corrected by volar rerouting of the lateral slip and lateral band. Here, the reverse of the hooding deformity takes place. The lateral band and lateral slips migrate dorsal to the axis of the PIP joint, resulting in hyperextension of the PIP joint and flexion at the DIP joint. To correct this deformity, the lateral band and slip of one side of the finger is freed, cut as proximally as possible, leaving intact its distal attachment to the base of the terminal phalanx. The proximal end is then passed volar to the Ligament of Cleland and sutured to the flexor tendon sheath. Alternatively, the proximal cut end of the lateral band can be sutured back to the dorsal expansion proximally, producing a slight flexion of the PIP joint . Skin contractures of the fingers are surgically released by cutting across the contracture, fishtailing the edges, and extending the finger to the straight position . If the resulting defect has no exposed tendon, then it can be covered with a full-thickness skin graft and immobilized in the extended position. If the fibrous flexor sheath is opened and the underlying tendon is exposed, the defect needs a flap cover, either a cross finger flap or a homodigital artery flap. Soft tissue defects of the first web space with skin contractures are common in leprosy and are recognized as stigmata of this disease in some cultures. Soft tissue mobilization and reconstruction can be dealt with in a variety of ways after contracture release of the web. The last three flaps introduce additional tissue to keep the web space wide open. Any of these tissues or implants will increase the bulk in the web space and eliminate its hollow appearance. A loss of sensation leads to the loss of protective reflexes. Pain causes a person with normal sensation to protect or rest the injured part of a limb. Loss of the pain impulse allows a patient to continue to use an injured limb, despite damage to the tissues. Thus, ulcers and other soft-tissue damage, like tissue strains and sprains and even fractures of the underlying bone, can result. The pressure of continuous weight on the ulcerated part of the foot can result in non-healing or chronic ulceration. Further, if the wound is left to heal by rest alone, it heals with scarring. Scars themselves form points of increased weight bearing. Additionally, scars lack an adequate blood supply. Because of the reduced blood supply in scars, repeated ulceration on scarred areas does not promote the second stage of healing, which again results in more scarring with less granulation and epithelialization. Further healing causes all layers of the foot to heal en masse. Over the rest of the foot, the tissues slide and glide over each other while walking or running, but the different layers are tethered at the scar in a scarred foot. Shearing stresses cause the scar to break down and lead to recurrence of ulceration . Recurrent ulcers with poor surrounding fibrous scarring do not heal easily. Even rest may not permit support to the underlying prominent bony tissue. Large tissue defects can result, and these cannot heal spontaneously by secondary intention. These defects need reconstruction using a flap cover. Such defects can occur over the heel, on the lateral border of the foot, over the metatarsal heads, and over the lateral malleoli. Big toe base ulcers are dealt with by debridement and toe web transposition flap. Lateral malleolar ulcers can be debrided and left to heal by secondary intention while immobilized in splints or casts. For defects that have exposed bone or tendon, a reversed sural artery flap can be used to cover the defect. The most common problem affecting the anesthetic foot, and ironically the most commonly overlooked diagnosis, is that of acute (or acute on chronic) neuropathic disintegration of the foot. This problem has been referred to as ‘Charcot’s foot’, ‘hot foot’, or simply ‘neuropathic disintegrated foot’ , . Patients usually complain of swelling of the affected foot. On palpation, a foot that is warm or ‘hot’ is due to strain leading to a torn ligament, a fracture, or a disrupted joint capsule. This phenomenon of the ‘hot foot’ can occur repeatedly after the inflammation has subsided and the tissues have healed, either in a position corrected by treatment or in an abnormal position due to neglect. Radiographs in cases of ligament strains and tears will appear normal. If there are bony lesions, they usually involve avulsion of a calcaneal fragment by the tendo Achilles, a crush fracture of the navicular bone, or a crush fracture of the head or neck of the talus (Figure 10). In a patient with leprosy, a hot, swollen foot should be considered a neuropathic foot unless proved otherwise. The foot should be elevated with the patient on complete bed rest for two days, or until the palpable hot foot is cold. Bed rest should be followed by immobilization in a non-weight-bearing, below-knee plaster cast for one month. During this period, the patient should continue elevating the foot. The edema will subside by the end of the month and the plaster cast will be loose. It must therefore be removed and reapplied with a Bohler iron to facilitate ambulation. The immobilization is continued for four more months. At the end of the fourth month, the cast is removed and a mold taken for a Fixed Ankle Brace (Ankle-Foot-Orthosis or AFO). The plaster cast is then reapplied for one more month. Meanwhile, the AFO is prepared. At the end of this month, the plaster cast is removed and walking exercises are started with the patient wearing the AFO. If swelling reappears at this stage, the limb is bandaged with elasto-crepe and elevated. The AFO needs to be worn for a minimum period of one and a half years. The foot and brace need to be examined every three months. The problem of a ‘hot foot’ can recur in the same patient and can occur in patients at different stages of disintegration. Therefore the clinician should always be vigilant so as not to miss this condition. The arthrodesis procedures use varied techniques. Fritschi has incorporated compression arthrodesis techniques or Blount’s staples for arthrodesis of the subtalar joints . Dong and colleagues have used the vascularized lower third of the fibular as a bone graft for arthrodesis of the ankle and subtalar joints . Warren has used Blount’s staples and Kirschner wires (‘K’ wires) to recreate the lost arch and fuse joints . The neglected neuropathic hand that has been used for support or has suffered strains due to heavy work sometimes suffers disintegration of the carpal bones, similar to that suffered by the tarsal bones of the feet. Here the wrist can become completely unstable and may need to be stabilized by procedures on the bone . Wrist instability is addressed by wrist arthrodesis. Contracture of the interphalangeal joints of the fingers not amenable to contracture release and soft tissue cover is addressed using interphalangeal joint arthrodesis. Metacarpophalangeal joint arthrodesis of the thumb is sometimes done to stabilize the joint in cases of ‘Z’ thumb deformity or if a ‘crank shaft effect’ or ‘crank handle effect’ is present. The ‘Z’ deformity is a hyperextension of the first metacarpophalangeal joint and flexion of the interphalangeal joint of the thumb. The ‘crank shaft effect’ or ‘crank handle effect’ is seen in cases of flexor polices brevis paralysis, when during pinch (attempted pulp to pulp pinch of the index finger), the opposition is lost and, instead, the carpometacarpal joint collapses into supination of the thumb. In both of these cases, arthrodesis of the carpometacarpal joint is performed to provide stability . The mitten hand, which is missing all fingers, usually leaves the hand totally functionless. There are four grades of mitten hand based on the presence or absence of the metacarpophalangeal joints of the fingers and thumb. Surgery of the mitten hand, such as pollicization of a digital remnant to create a radial post, is done to promote function in an otherwise functionless stump . Creation of a web space is a procedure that also promotes function in a mitten hand and is usually combined with pollicization of the stump of the index finger. Infected cartilage and infected tendons are difficult to treat because of poor vascularity, and systemic medication does not reach the target site. Infected cartilage sequestrates and remains as an infective nidus. 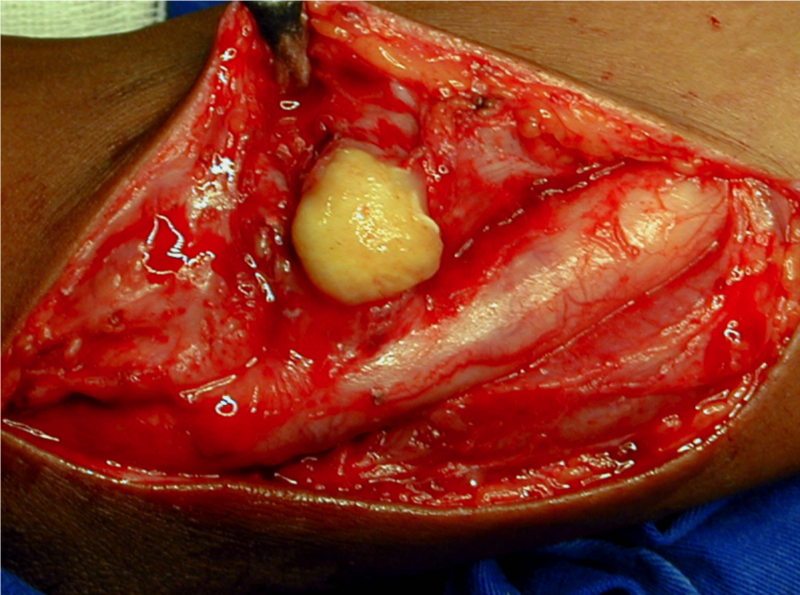 The infected tendon sloughs and acts as a pathway for proximal spread of the pus. Thus, what started as an infection of the tip of the finger or toe can spread into the forearm or leg. In these cases, ablative debridement procedures are indicated, for example, debridement of infected tissue and non-viable tissue. The procedures may involve only debridement or amputation in addition to debridement. Physiotherapy plays an important role in the restoration of function in all types of surgery associated with leprosy. In tendon transfers, the pre-operative assessment (the decision as to which muscle is to be used) depends upon with the physiotherapeutic assessment. Post-operative physiotherapy conventionally starts three weeks after surgery and continues for a month. There is a recent effort to advance physiotherapy protocol by not immobilizing the limb following surgery, but rather to start ‘early mobilization’. This approach is still under study and is not yet recommended as a routine. Soft tissue reconstruction of the sole requires podiatric assessment before surgery as well as gait training after surgery before the patient can be allowed to walk normally. Orthotics and prosthetics are a part of the post-operative protocol and their role needs to be taken into consideration even at the time of planning the surgical procedure. Therefore, surgery in leprosy is interdependent on physiotherapy, occupational therapy, podiatry, orthotic and prosthetic disciplines, and counseling. The surgeon would do well to develop part of a team to deal with surgical interventions in leprosy. The members of the team would include those in the above disciplines. One of the chief members of the team should be the patient for, after all, the patient is the one who will be left to cope with the result. Leprosy is primarily a skin and neurological disease but may become systemic in multibacillary patients. Neuropathy due to leprosy is still diagnosed and treated late, or ignored altogether, leaving about 25% of patients with a permanent disability. Early diagnosis and treatment of leprosy and the related neuropathy is the only way to prevent severe nerve impairment. Therefore, it is necessary to conduct NFAs several times a year, more frequently if the patient exhibits reactions. Ballpoint pen, wool, or “pocket nylon monofilaments” for sensation . Monofilaments in combination with the VMT are the most dependable tests for the field. Graded instrumental tests for temperature: Thermal Sensitive Tester (TST) , Thermal Sensory Analyzer (TSA) 2001, and (Medoc Ltd Israel) . These are the most sensitive tests for early neuropathy lesions. The use of decompressive surgery for leprosy neuropathy is controversial. Most clinicians believe that treatment with corticosteroids will decompress the nerve. However, many surgeons believe that surgical decompression provides a greater and immediate benefit. These treatments should complement each other. Although agreed upon, these indications are seldom followed, especially indications two and three. The main reasons for the failure to assess indications two and three are a lack of trained health teams that can perform timely follow-up on nerve function and the difficulty of obtaining monofilaments for graded sensory testing in the field. There are several procedures adjunct to the surgical decompression of nerves, each of which is discussed below. Epineurotomy. Several randomized studies have not shown any benefit from epineurotomy , . Internal neurolysis. This procedure has been used successfully for nerves in other conditions but not in leprosy . In leprosy, there is severe interfascicular fibrosis. It is impossible to dissect the fascicles without damaging the vascular supply and fascicle interconnections . Some leprosy surgeons use internal neurolysis for selected cases . Mesh epineurotomy. Theuvenet, Gavin-Finlay, and Roche  developed a new technique for nerve decompression that consists of multiple small incisions in the epineurium, all around the nerve. The mesh allows the nerve to expand. Endoscopic release. This technique gives the same results as open release . The complications are more serious, for example, the transection of nerves . It is necessary to add an open technique to complete the deep decompression of the fibular, ulnar, and tibial nerves. The endoscopic technique is not recommended for the treatment of neuropathy in leprosy. A Cochrane review of studies of decompressive surgery in leprosy  was not conclusive with respect to the benefits of nerve surgery. In spite of that finding, some studies have reported some interesting beneficial results from decompressive surgery , . Pain relief was the most frequent result and it was found that nerve function impairment recovery relied on the duration and severity of the neuropathy before diagnosis. A nerve abscess may be seen in tuberculoid (paucibacillary) patients with Type I reaction. Only a few fascicles may be involved, with an epitheloid granuloma, and the edema created may compress healthy fascicles. Some fascicles may necrose and form an abscess. The nerve is decompressed by debriding the abscess , ,  (Figure 11). At the elbow, the ulnar nerve is located subcutaneously, where it is exposed to trauma and low temperature. It is located in a constricting osteofibrotic canal and has to glide and stretch with elbow flexion. The result of compression and stretch on the nerve with leprosy pathology and fibrosis will be ischemia , , , . The ulnar nerve can also be compressed at the wrist in Guyon’s canal, where it is joined by the artery and vein. There might be pain, swelling, or a positive Tinel’s sign that can localize the lesion , . The most common cause for the failure of ulnar nerve decompression is an incomplete resection of the medial septum in the arm. It is also important that the nerve supply to the nerve from its bed be carefully mobilized to permit it to continue to perform its vascular functions in the new position. Leave the nerve in its groove (in situ). In a simple or in situ ulnar nerve decompression, the ulnar nerve is decompressed in all sites and freed, but left in the ulnar groove . The in situ technique is indicated for mild compression and is commonly used in leprosy. Anterior transposition. If the ulnar nerve is dislocated or subluxed in the retrocondylar groove, the nerve is traumatized each time it dislocates over the epicondyle. The solution is an anterior transposition , . An anterior transposition eliminates stretching of the fibrotic nerves. Subcutaneous transposition. In a subcutaneous transposition, the ulnar nerve is dissected free, transposed anteriorly, and placed on the fascia of the prono-flexor muscle mass. It is important to attach the nerve firmly at the correct position, 3–4 cm from the epicondyle. Submuscular transposition. In a submuscular anterior transposition, the ulnar nerve is placed underneath the pronator and flexor muscles mass. The detached muscle should be reattached firmly so that early mobilization of the elbow is possible . The submuscular transfer is indicated in severe neuropathies and is also performed as a salvage procedure for failed surgeries. Intramuscular transposition. Only a few publications address intramuscular transposition of the ulnar nerve . Early mobilization is important to prevent scarring of the nerve in the muscle. Medial epicondylectomy. Removing the epicondyle at the elbow allows the ulnar nerve to move forward to the flexor area. The traction on the ulnar nerve caused by elbow flexion and extension and the compression in the ulnar tunnel are eliminated . Reviews of surgery for the ulnar nerve at the elbow show similar results for all operations with no significant difference , , . In leprosy, the median nerve may be compressed in the carpal tunnel with swelling and pathology proximal to the tunnel. A complete claw hand and total paralysis and atrophy of the thumb may develop, resulting in severe functional disability and stigmatizing deformity. For the decompression of the median nerve, it is important to release the forearm fascia first and then dissect distally. Hussain  reports on 20 median nerve releases. All 20 surgeries resolved the pain. Eighteen of the surgeries resulted in full sensory recovery. Nine of the surgeries improved muscle strength. The tibial nerve is important because a lesion may cause loss of sensation in the plantar area of the foot, resulting in plantar ulcer and pathological fractures of the tarsal bones (Charcot foot). For this reason, many surgeons advise decompressive surgery of the tarsal tunnel when the first symptoms of nerve damage manifest . In a study of tarsal tunnel release, out of 84 feet, the surgery resulted in complete improvement of sensation in 17% and moderate improvement in 58%. The Ninhydrin test improved in 65% of 41 feet. Rao and Swamy  compared surgery with corticosteroids versus surgery. The result was a 72% improvement in the group receiving corticosteroids plus surgery, compared to a 52% improvement in the group receiving surgical treatment alone. The common fibular nerve very often regains function spontaneously. Therefore, reconstructive or decompressive surgery should be delayed for six months. Drop foot is a severe disability created by a lesion of the common fibular nerve. The foot is often in a varus position, which creates a lateral border ulcer that can progress to a short foot in fixed varus . Although seldom impaired in leprosy, the radial nerve may be compressed in the torsion canal of the humerus, but most often by the edge of the supinator muscle fascia. In this case, the fascia must be excised . The patient is sometimes stressed because of the surgery, which may precipitate a reaction (see Chapter 2.2), usually a Type 2 reaction. A post-surgical hematoma can cause perineural fibrosis and scarring. Incomplete decompression of all constricting structures. Unstable ulnar nerve with dislocation or subluxation. Lesions of subcutaneous nerves, especially the medial cutaneous nerve of the forearm, that can leave a painful neuroma. Section of the palmar superficial vascular arch. Iatrogenic lesions of any nerve, especially with the endoscopic technique . Elbow instability after an epicondylectomy. The area with pathology is extensive, making it difficult to determine the exact area to be excised. Leprosy affects the whole nerve, with a loss of 50% or more of axons . After resection of the pathological area, the gaps in the nerve are large (7–20 cm). In leprosy, many subcutaneous nerves are usually involved. Therefore, the autologous nerve graft is not a viable option in leprosy. Gye, McLeod, Hargrave, Loewental, Pollard, and Booth  have used allografts with immunosuppression in leprosy patients, but achieved minimal re-innervation as a result. All nerves lost complete function when the immunosuppression was discontinued. Many attempts are being made to create an artificial nerve with different substances using Nerve Growth Factor and other factors. Some of the experimental results are promising . When Wallerian degeneration occurs in a complete nerve lesion, tubes of empty Schwann cells are left distally. Laminin is a component of the Schwann cell membrane and attracts the regenerating axons to grow along the neurotubes. The muscle is denatured, leaving the membrane skeleton for axons to grow along. In India, a study was done of 11 median and 30 tibial nerve grafts in 34 patients . A follow-up was conducted over 4–14 years. Nerve conduction studies were negative both before and after surgery. The review of the median nerve grafts showed some functional sensory results, and a few had protective sensation. Sixteen of the tibialis posterior nerves had isolated areas of the sole responding to the 300 mg monofilament, and 16 of the patients said that they “felt something”. Grafting nerves in leprosy will always achieve poor results because the gaps to be closed are large. The nerve ends, after the resection of the severely damaged portion, will always present leprosy pathology, with a limited number of healthy axons available for re-enervation. Neuropathy can continue to develop for a long time after MDT has been completed  (see Chapter 2.5). Improvements in nerve function from decompressive surgery seldom reach more than 40–50% in neuropathies of more than six months’ evolution. When combining surgery and corticosteroid treatment, the results will improve, but even so, 25–30% of patients will have severe or complete loss of nerve function. Decompressive nerve surgery should be considered an addition to medical treatment. Referral to surgery should be considered if the corticosteroids do not control the neuropathy. However, we are a long way from controlling the neuropathy in leprosy. Since the prevalence of leprosy is diminishing, less knowledgeable professionals will be engaged in the management of patients. Therefore, we need to keep a nucleus of experienced clinicians and surgeons to train the professionals in the public health system . Dr. Joshua acknowledges The Leprosy Mission Trust India, for providing the clinical material, photographs and the technical inputs for this article. Dr. Frank Duerksen wishes to acknowledge Jeannette Timmerman for editing the first draft of this manuscript and his son Ron Duerksen for suggestions and editing. He thanks also Janice Linton, librarian at the Neil John MacLean Health Science Center Library, University of Manitoba, for assisting him in getting references. ^ Liu YM, Sherrie DA. 2008. Static procedures for the management of the midface and lower face. Facial Plast Surg 24:211–215. ^ Boahene KD. 2008. Dynamic muscle transfer in facial reanimation. Facial Plast Surg 24:204–210. ^ Misra B, Grover R, Withey S, Grobbelaar AO, Harrison DH. 2000. Reducing postoperative morbidity after insertion of gold weights for treatment of lagophthalmos. Ann Plast Surg 45:623–628. ^ Inigo F, Chapa P, Jimenez Y, Arroyo O. 1996. Surgical treatment of lagophthalmos in facial palsy: ear cartilage graft for elongating the levater palpebrae muscle. Brit J Plast Surg 49:452–456. ^ Warren G. 1990. 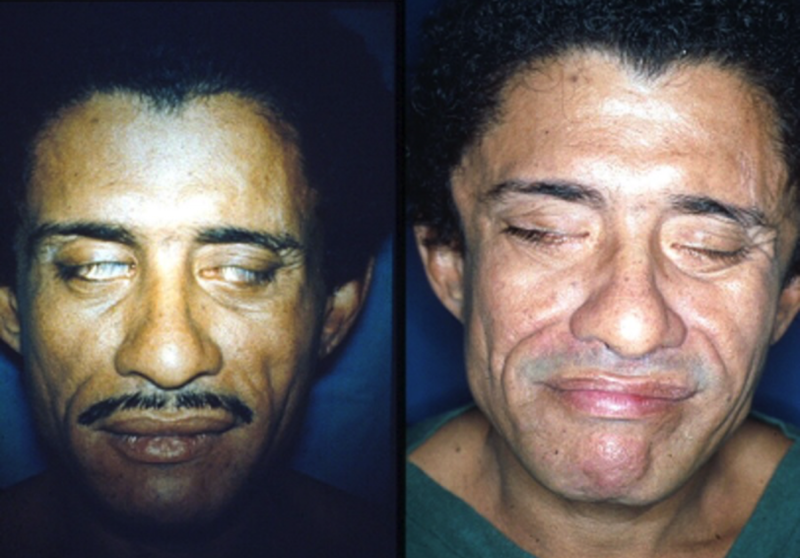 Facial palsy—a leprosy surgeon’s viewpoint. Aust N Z J Ophthalmol 18:255–266. ^ Anderson RL, Gordy DD. 1979. The tarsal strip procedure. Arch Ophthalmol 97:2192–2196. ^ Gillies V. 1934. Experience with fascia lata grafts in the operative treatment of facial paralysis. Proc R Soc Med 27:1372. ^ Andersen JG. 1961. Surgical treatment of lagophthalmos in leprosy by the Gillies temporalis transfer. Brit J Plast Surg 14:339–341. ^ Ranney DA, Furness MA. 1973. Results of temporalis muscle transfer in lagophthalmos due to leprosy. Plast Reconstr Surg 51:303–611. ^ Job CK, Chel S, McKormick GT, Hastings RC. 1987. Mycobacterium leprae can penetrate nasal mucosa. Indian J Lepr 59:356–357. ^ Moller-Christensen V, Faber B. 1952. Leprous changes in material of mediaeval skeletons from the St George’s Court, Naestved. Acta Radiol 37:308–317. ^ Gillies HD. 1920. Plastic surgery of the face. p 415–421. Total rhinoplasty. London, England, Frowde. a, b Farina R. 1953. Colapso da ponta do nariz na lepra por perda de substância condro-mucosa (reparação do estôfo nasal com retalhos genianos) [Collapse of the tip of the nose in leprosy due to loss of substance chondrial-mucosa]. Rev Bras Leprol 21:1–4. a, b Menger DJ, Fokkens WJ, Lohuis PS, Ingels KJ, Trenite GJN. 2007. 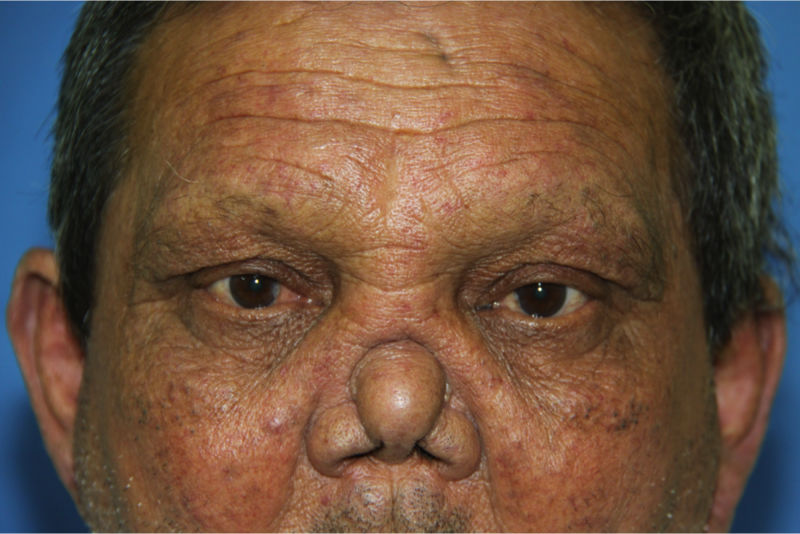 Reconstructive surgery of the leprosy nose: a new approach. J Plast Reconstr Aesthet Surg 60:152–162. ^ Shah AR, Zeitler D, Wise JB. 2009. Nasal reconstruction of the leprosy nose using costal cartilage. Otolaryngol Clin North Am 42(3):547–555. ^ Guerrero-Santos J. 1970. Correction of hypertrophied earlobes in leprosy. Plast Reconstr Surg 46:381–383. ^ Constant E. 1979. Reduction of the hypertrophic earlobe. Plast Reconstr Surg 64:264–267. ^ Adams WN. 1955. Construction of upper half of auricle utilizing composite chondral cartilage graft with pericondrium attached on both sides. Plast Reconstr Surg 16:88. ^ Kirkpatrick SW, Bell GE, Johnson C, Perkins J, Sullivan LA. 1996. Interpretation of facial expressions of emotion: the influence of eyebrows. Genet Soc Gen Psychol Monogr 122:405–423. PMID: 8976597. ^ Mukhin MV. 1965. Reconstruction of eyebrow with a skin flap on a subcutaneous vascular pedicle. Acta Chir Plast 7:15. ^ Klassen AF, Cano SJ, Schwitzer JA, Scott AM, Pusic AL. 2015. FACE-Q scales for health-related quality of life, early life impact, satisfaction with outcomes, and decision to have treatment: development and validation. Plast Reconstr Surg 135:375–386. a, b, c, d, e, f, g, h Fritschi EP. 1984. Surgical reconstruction and rehabilitation in leprosy, 2nd ed. New Delhi, India, The Leprosy Mission. ^ Rath S. 2008. Immediate postoperative active mobilization versus immobilization following tendon transfer for claw deformity correction in the hand. J Hand Surg Am 33A(2):232–240. ^ Burkhalter W, Christensen RC, Brown P. 1973. Extensor indicis proprius opponensplasty. J Bone Joint Surg Am 55(4):725–732. ^ Sridhar K. 2011. Tendon transfer for median nerve palsy. Indian J Plast Surg 44:357–361. ^ Rath S. 2006. Immediate active mobilization versus immobilization for opposition tendon transfer in the hand. J Hand Surg Am 31A:754–759. ^ Das P, Kumar J, Karthekeyan G, Sundar Rao PSS. 2013. Peroneal strength as an indicator in selecting route of tibialis posterior transfer for foot drop correction in leprosy. Lepr Rev 84:186–193. a, b MacDonald MRC. 2004. Common peroneal nerve and tibial nerve paralysis. In Schwarz R, Brandsma W (eds), Surgical reconstruction and rehabilitation in leprosy and other neuropathies, p 175–191. Kathmandu, Ekta Books Distributors Pvt Ltd.
^ Srinivasan H, Palande DD. 1997. Essential surgery in leprosy: techniques for district hospitals, p 109–115. Geneva, Switzerland, World Health Organization. ^ Elliot RA. 1990. Extensor tendon repair, p 4565–4592. In McCarthy JG (ed), Plastic surgery, vol 7. Philadelphia, PA, WB Saunders Company. a, b, c Virmond M, Pereira HR. 2004. Management of miscellaneous conditions of the paralysed hand, p 97–111. In Schwarz R, Brandsma W (eds), Surgical reconstruction and rehabilitation in leprosy and other neuropathies. Kathmandu, Ekta Books Distributors Pvt Ltd.
a, b Malaviya G, Richards B. 2004. Restoration of function in a mitten hand, p 113–125. In Schwarz R, Brandsma W (eds), Surgical reconstruction and rehabilitation in leprosy and other neuropathies. Kathmandu, Ekta Books Distributors Pvt Ltd.
^ Soutar DS, Tanner NSB. 1984. The radial forearm flap in the management of soft tissue injuries of the hand. Br J Plast Surg 37:18–26. ^ Zancolli EA, Angrigiani C. 1988. Posterior interosseous island forearm flap. J Hand Surg Br 13:130–135. ^ Pederson WC, Lister G. 2010. Local and regional flap coverage of the hand. In Wolfe SW, Pederson WC, Hotchkiss RN, Kozin SH, Green’s operative hand surgery, 6th ed. London, England, Churchill Livingstone. ^ Brand PW. 1981. Insensitive feet: a practical handbook on foot problems in leprosy. The Leprosy Mission. ^ Malaviya GN. 2005. Closure of simple heel ulcers by skin stretching. Indian J Lepr 77(3):255–265. ^ Joshua J, Sarkar S. 2004. Management of 34 chronic heel sinuses in leprosy, using a modification of a local rotation flap in Kolkata, India. Lepr Rev 75:254–265. ^ Shah A, Pandit S. 1985. Reconstruction of the heel with chronic ulceration with flexor digitorum brevismyocutaneous flap. Lepr Rev 56(1):41–48. ^ Schwarz RJ, Negrini JF. 2006. Medial plantar artery island flap for heel reconstruction. Ann Plast Surg 57(6):658–661. ^ Hasegawa M, Torii S, Katoh H, Esaki S. 1994. The distally based superficial sural artery flap. Plast Reconstr Surg 93:1012–1020. ^ Dong L, Li F, Jiang J, Zhang G. 2000. Techniques for covering soft tissue defects resulting from plantar ulcers in leprosy: Part V. Use of the flap in the inguinal region and latissimus dorsi musculocutaneous flap. Indian J Lepr 72(2):227–244. ^ Joshua J, Chakraborthy V. 2005. Wound coverage of plantar metatarsal ulcers in leprosy using a toe web flap. Indian J Plast Surg 38(2):123–127. ^ Dong L, Li F, Jiang J, Zhang G. 1999. Techniques for covering soft tissue defects resulting from plantar ulcers in leprosy: Part II—First toe web and dorsal foot flaps. Indian J Lepr 71(3):297–309. a, b Schwarz R. 2006. Reverse medial plantar artery flap. Lepr Rev 77(1):69–75. ^ Dong L, Li F, Wang Z, Jiang J, Zhang G, Peng J, Zhang J, Ye Y. 1999. Techniques for covering soft tissue defects resulting from plantar ulcers in leprosy: Part I—General considerations and summary of results. Indian J Lepr 71(3):285–295. ^ Dong L, Li F, Zhang J, Ye Y, Zhang G, Guocheng Z. 1999. Techniques for covering soft tissue defects resulting from plantar ulcers in leprosy: Part III. Use of plantar skin or musculocutaneous flaps and anterior leg flap. Indian J Lepr 71(4):423–436. a, b, c, d Warren G. 2004. Neuropathic feet, p 147–174. In Schwarz R, Brandsma W (eds), Surgical reconstruction and rehabilitation in leprosy and other neuropathies. Kathmandu, Ekta Books Distributors Pvt Ltd.
^ Dong L, Li F, Jiang J, Zhang G. 2000. Transplantation of fibula with vascular pedicle for fusion of ankle in leprotic drop-foot. Indian J Lepr 72(4):431–436. ^ Schwarz R, Joshua J, Warren G. 2004. Radial nerve palsy, p 83–95. In Schwarz R, Brandsma W (eds), Surgical reconstruction and rehabilitation in leprosy and other neuropathies. Kathmandu, Ekta Books Distributors Pvt Ltd.
a, b Bell-Krotoski J. 1990. “Pocket filaments” and specification for the Semmes-Weinstein monofilaments. J Hand Ther 3:26–31. ^ Medical Research Counsel War Memorandum. 1952. Aids to the investigation of peripheral nerve injuries, Memorandum Number 7, 2nd ed. His Majesty’s Stationery Office, Great Britain. ^ Dellon AL. 1983. The vibrometer. Plast Reconstr Surg 71:82. ^ Dellon AL, Clayton H, Kallman M Sr. 1983. Evaluation of functional sensation in the hand. J Hand Surg 8:865–870. ^ Garbino JA. 1997. Eletroneuromiografia em hanseníase, p 93–104. In Duerksen F, Virmond M (eds), Cirurgia reparadora e reabilitação em hanseníase. ALM International Inc.
^ Illarramendi X, Buhrer-Sekula S, Sales AM, Bakker MI, Oliveira A, Nery JA. 2005. High prevalence of vasomotor reflex impairment in newly diagnosed leprosy patients. Eur J Clin Invest 35:658–665. ^ Van Brakel WH, Saunderson P, Shetty V, Brandsma JW, Post E, Jellema R, McKnight J. 2007. International workshop on neuropathology in leprosy—consensus report. Lepr Rev 78:416–433. ^ Schreuders T, Kuipers M. 1992. Thermal sensibility tester. Can it be used to find early nerve damage in leprosy. Lepr Rev 63:294. ^ Van Brakel WH, Nicholls PG, Das L, Barkataki P, Maddali P, Lockwood DNS, Wilder-Smith E. 2005. The INFER cohort study: assessment of sensory and motor neuropathy in leprosy at baseline. Lepr Rev 76:277–295. ^ Croft RP, Nicholls RG, Richardus JN, Cairn W, Smith S. 2000. The treatment of acute nerve function impairment in leprosy: results from a prospective cohort study in Bangladesh. Lepr Rev 71:154–168. ^ Saunderson P. 2000. The epidemiology of reactions and nerve damage. Lepr Rev 71(suppl):S106–S110. ^ Blair WF, Goetz DD, Ross MA, Steyers CM, Chang P. 1996. Carpal tunnel release with and without epineurotomy: a comparative prospective trial. J Hand Surg 21A:655–661. ^ Foulkes GD, Atkinson RE, Beuchel C, Doyle JR, Singer DT. 1994. Outcome following epineurotomy in carpal tunnel syndrome: a prospective, randomized clinical trial. J Hand Surg Am 14A:539–547. ^ Curtis RM, Eversmann WW. 1973. Internal neurolysis as an adjunct to the treatment of the carpal-tunnel syndrome. J Bone Joint Surg Am 55A:733–740. a, b Sunderland S. 1973. The internal anatomy of nerve trunks in relation to the neural lesions of leprosy. Brain 96:865–888. ^ Carayon A, Van Droegenbrook J, Languillon J. 1985. Surgical decompression of neuritis of Hansen’s Disease. Acta Leprol 3:37–66. ^ Theuvenet WJ, Gavin-Finlay K, Roche RW. 2006. Change of sensation in leprosy by selective meshing of the epineurium. Eur J Plast Surg 28:393–399. ^ Brown RA, Gelberman RH, Seiler JG, Abrahamsson SO, Weiland AJ, Urbaniak JR, Schoenfeld DA, Furcolo D. 1993. Carpal tunnel release. A prospective, randomized assessment of open and endoscopic methods. J Bone Joint Surg 75A:1265–1273. ^ Murphy RX Jr, Jennings JF, Wukich DK. 1994. Major neurovascular complications of endoscopic carpal tunnel release. J Hand Surg Am 19A:114–118. ^ Van Veen NTJ, Schreuders TAR, Theuvenet WJ, Agrawal A, Richardus SH. 2009. Decompressive surgery for treating nerve damage in leprosy. A Cochrane review. Lepr Rev 80:3–12. ^ Palande DD, Azhaguray M. 1975. Surgical decompression of the porterior tibial neurovascular complex in the treatment of certain chronic plantar ulcer and posterior tibial neuritis in leprosy. Int J Lepr Other Mycobact Dis 43(1):36–40. ^ Van Droogenbroeck JBA, Naafs B. 1977. Etude comparative d’une série de nerfs lépreux décomprimés chirurgicalement par rapport aux nerfs contralatéraux non-opérés. Med Trop 37:771–776. ^ Bhagat KP, Wange HM, Takani BU. 1980. Management of nerve abscesses in leprosy. Indian J Dermatol Venereol Leprol 46:110–112. ^ Rai D, Malhotra HS, Gorg RK, Goel MV, Malhotra KF, Kumar V, Singh AK, Jain A, Kalik N, Singh SH. 2013. Nerve abscess in primary neuritic leprosy. Lepr Rev 84:136–140. ^ Kumar P, Saxena R, Mohan L, Thacker AK, Mukhija RD. 1997. Peripheral abscesses in leprosy: report of twenty cases. Indian J Lepr 69:143–147. ^ Lundborg G, Rydevik B. 1973. Effects of stretching the tibial nerve of the rabbit. A preliminary study of the intraneural circulation and the barrier function of the perineurium. J Bone Joint Surg Br 55B:390–401. ^ Rydevik BL, Kwan MK, Myers AR. 1990. An in vitro mechanical and histological study of acute stretching on rabbit tibial nerve. J Orthop Res 8:694–701. ^ Haftek J. 1970. Stretch injury of peripheral nerve. Acute effects of stretching on rabbit nerve. J Bone Joint Surg Br 52B:354–365. ^ McFarlane RM, Meyer JR, Hugill JV. 1976. Further observations on the anatomy of the ulnar nerve at the wrist. Hand 8:115–117. ^ Kleinert HE, Hayes JE. 1971. The ulnar tunnel syndrome. Plast Reconstr Surg 47:21–24. ^ Heithoff SJ. 1999. Cubital tunnel does not require transposition of the ulnar nerve. J Hand Surg 24A:898–905. ^ Childress HM. 1956. Recurrent ulnar-nerve dislocation at the elbow. J Bone Joint Surg 38–A:978–984. ^ Rayan GM. 1990. Recurrent anterior dislocation of the ulnar nerve at the elbow. Plast Reconstr Surg 86:773–775. ^ Kleinman WB. 1999. Cubital tunnel syndrome: anterior transposition as a logical approach to complete nerve decompression. J Hand Surg Am 24A:886–897. ^ Kleinman WB, Bishop AT. 1989. Anterior intramuscular transposition of the ulnar nerve. J Hand Surg Am 14A:972–979. ^ Oommen PK. 1979. Ulnar nerve decompression by medial epicondylectomy of the humerus and a method of assessing muscle power status by totalling the muscle grading. Lepr India 51:336–340. ^ Craven PR Jr, Green DP. 1980. Cubital tunnel syndrome. Treatment by medial epicondylectomy. J Bone Joint Surg Am 62:986–989. ^ Seradge H, Owen W. 1998. Cubital tunnel release with medial epicondylectomy factors influencing the outcome. J Hand Surg Am 23A:483–491. ^ Dellon AL. 1989. Review of treatment results for ulnar nerve entrapment at the elbow. J Hand Surg Am 14A:688–700. ^ Husain S, Mishra B, Prakash V, Malaviya GN. 1997. Evaluation of results of surgical decompression of median nerve in leprosy in relation to sensory-motor functions. Acta Leprol 10:199–201. ^ Oommen PK. 1996. Posterior tibial neurovascular decompression for restoration of plantar sweating and sensibility. Indian J Lepr 68:75–82. ^ Rao KS, Siddalinga Swamy MK. 1989. Sensory recovery in the plantar aspect of the foot after decompression of posterior tibial nerve. Possible role of steroids along with decompression. Lepr Rev 60:284–287. ^ Chaise F, Roger B. 1985. Neurolysis of the common peroneal nerve in leprosy. J Bone Joint Surg Br 67B:426–429. ^ Roles NC, Maudsley RH. 1972. Radial tunnel syndrome: resistant tunnel elbow as a nerve entrapment. J Bone Joint Surg Br 54B:499–508. ^ Richard B, Khatri B, Knolle E, Lucas S, Turkof E. 2001. Leprosy affects the tibial nerves diffusely from the middle of the thigh to the sole of the foot, including skip lesions. Plast Reconstr Surg 107:1717–1724. ^ Gye RS, Hargrave JC, Loewenthal J, McLeod JG, Pollard JD, Booth GC. 1972. Use of immunosuppressive agents in human nerve grafting. The Lancet 299(7752):647–650. ^ Seckel BR, Chiu TH, Nyilas E, Sidman RL. 1984. Nerve regeneration through synthetic biodegradable nerve guides: regulation by the target organ. Plast Reconstr Surg 74:173–181. ^ Pereira JH, Bowden RE, Narayanakumar TS, Geschmeissner SE. 1996. Peripheral nerve reconstruction using denaturate muscle autografts for restoring protective sensation in hands and feet of leprosy patients. Indian J Lepr 68:83–91. ^ Van Brakel WH, Khawas IB. 1994. Nerve damage in leprosy: an epidemiological and clinical study of 396 patients in west Nepal—Part 1. Definitions, methods and frequencies. Lepr Rev 65:204–221. ^ Duerksen F, Opromolla DVA, Virmond M, Garbino J. 1999. Teaching and training for surgical rehabilitation in Hanseniasis: results of 20 years activities of the Instituto Lauro de Souza Lima in South America. Hansen Int 24:55–60.